Let’s say you’re in Hyderabad. And more particularly, in the Charminar area. And suddenly! you feel this burning desire to buy a fishing net. What do you do? What do you do? Maybe you’re fishing for the proverbial ‘other fish in the sea’ or maybe you’re a fisherman who really needs a net to catch some sea fish even though you’re miles and miles away from the nearest sea. Anyway, what do you do? What do you do? Fear not! This is Hyderabad, where I saw a lot of strange and disturbing things over a rushed weekend. And met a great bunch of people from Dell. No that’s not a spelling mistake, notwithstanding certain circles I move around it. It’s Dell! Not Hell!! All courtesy The Eyyala. Who nowadays, goes around under the strange moniker of ‘Daddy!’ (exclamation mark included). Now this bunch is as crazy as it gets. At least two of them have the grand ambition of shoplifting prophylactics (ahem! euphemism?). Stranger than that is the person who they’re being smuggled out of stores for. Charming chappie, apparently always ‘working out’, and not! in the gym. Watch out women…here comes da man. Now this is the same gang that is known to relax in bean bags. Nothing strange about that you say? But relaxing on bean bags at 4 in the morning on a main road in Hyderabad…right bang in the middle of the road. Well….these are crazy times we live in and these people are crazier than that. Split my sides just being with them. Now Daddy (previously known as The Eyyala) and me happened to pack in some hyderabadi mutton biriyani, the charminar and the golconda in a few hours. Of course a few land speed records were beaten. Not bad considering that traffic signals in Hyderabad don’t work the way they do everywhere else. Green means ‘Go’. Yellow means ‘Go’. Red stands for (you guessed it) ‘GO!’ Now each of these is a story in itself, not to mention the B&C + Tequila experience and the incursion into Mainland China. That was with Daddy’s Flock. Thank you gang for a great time!!! Dai! It is there. Try hitting the ‘refresh’ button. That was a hillarious script . 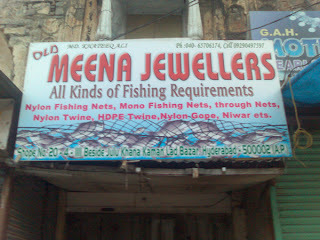 The picture of OLD Meena Jewellers which is visible speaks more than words. Ha ha ha... You have an uncanny knack of being at the wrong place at the right time! :) Good clickings! We are the Best Carpenters in Hyderabad. We deal with all types of carpentry works and we provide good service and quality is our motto.